Kourtney Kardashian has introduced her son Reign to the world. The 35-year-old Keeping Up with the Kardashians star welcomed the baby boy on December 14 last year, the same day her eldest son Mason was born. And Kourtney shared a snapshot of newborn Reign on her Instagram account Thursday. 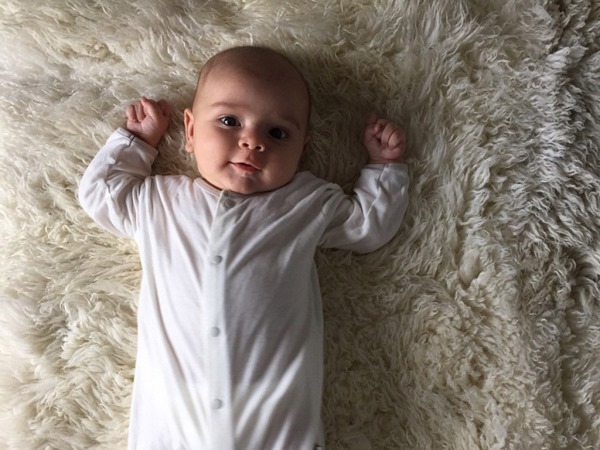 “My little turtle dove angel baby boy Reign Aston Disick,” she wrote in the photo caption. Little Reign donned a white button-up while lying comfortably in a recumbent position on a shaggy carpet in the photo, sporting a huge smile on his face. Reign is the third child Kourtney shares with partner Scott Disick. The couple are also parents to Mason, five, and daughter Penelope, two. Family patriarch Scott (31) left rehab in Costa Rica last month after being booked in the facility for just a few days. Although he has already sought therapy for addiction about a handful of times prior to his recent stint, Kourtney claimed his latest attempt was successful. “He's doing well, and, you know, really focusing on himself and working on himself. He's made a lot of progress, so I'm proud of him," she told E! News in March. However, it’s been reported the couple’s nine-year relationship is on the rocks. Apparently Scott’s most recent rehab departure had Kourtney feeling disenchanted. “The relationship has run its course,” a source told Radar Online previously. “With Scott’s refusal to stop drinking and partying, Kourtney doesn’t want to put any more effort into it.